… In my 20s and 30s I would wear high heels and wedges without a care in the world. Sure my feet would suffer but I was young and all about being cute. At 42 I still like them BUT they have to be comfortable. Since I cant wear the sky high ones, I keep my heels and wedges between 2 -2.5 inches. 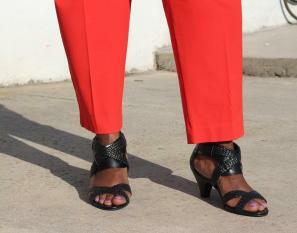 Today, I want to show you some comfortable heels and wedges that don’t sacrifice style! A couple of months ago Jessica London graciously sent me these sandals to review. Now that the weather is warm enough to wear them I have to say they are SO COMFORTABLE! I mean wear all day, feet not hurting after 3pm comfortable! The padded, flexible sole and 2.5 inch heel keep your feet pain-free. They are dressy mid heel sandals that work for upcoming graduations or weddings. Plus Jessica London is currently offering 40% off with code JLE4664 on your highest priced item. So if you decide to get them they’ll drop from $44.99 to $26.99! You can’t beat that with a stick!